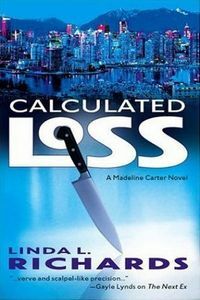 Calculated Loss by Linda L. Richards: Synopsis and Online Purchase Options. Synopsis (from the publisher): It's been years since former stockbroker Madeline Carter bothered thinking about her gastronomically gifted ex-husband, Chef Braydon Gauthier. Between quitting her soul-sucking career and discovering what life is like during daylight hours she's been kind of busy. But when Madeline learns Braydon took his own life, she drops everything and hightails it to the funeral. It doesn't take long to realize Braydon's death is more murder than suicide. Madeline knows her ex would never have prepared himself a poison-laced dinner of duck a l'orange — let alone pair it with a big, beefy Shiraz! The culinary star would have eaten fast food first. So who's responsible? Madeline definitely has her suspicions, but one thing's clear: in the pressure-cooker world of high cuisine and higher stakes, a reputation is worth killing for.